I joggled from foot to foot at Los Angeles International Airport, anxiously awaiting the arrival of our youngest son. He was coming home after the first semester of graduate school at Cornell University in Ithaca, NY, a long way from California. It was shortly before the 9-11 attacks against the World Trade Center, and we eager greeters were allowed to stand by the exit ramps as passengers tromped toward us. Hundreds of people came off that plane, crowded in ways that bring to mind encroachment of personal space. Adults pleased to be home, kids thrilled to be a few miles closer to Disneyland, tourists happy to finally visit the Golden State, businessmen hot to close deals, friends delighted to meet the old crew. The buzz of conversations boiled into a conglomerate muddle that mingled several languages though most spoke English. Except for a few toddlers wailing in the familiar trope of I’m tired, I’m hungry, they jabbered untroubled content. My son was sure to be the last person off the plane, no matter how excited his mama was to plant kisses all over his cheeks and squeeze him to death with hugs. It was pretty obvious who missed who the most. So I waited and smiled at everyone debarking the plane from New York’s JFK Airport. Not my son yet. A lapse in the line and then the people exiting changed. The cheerful folk gave way to those whose faces spoke of hardship, weariness, exhaustion. And quiet. They were all so quiet, even the little children holding onto adult hands. These folks weren’t dressed in fashionable jackets and jeans with chic knit scarves hanging over their tee shirts. The men wore the loose trousers like my grandfathers wore in the 1950’s. The children were bundled in layers of frayed, hand knit sweaters. None of them pulled snazzy Samsonite luggage or college backpacks. They lugged piles of enormous suitcases that looked like they were made of origami paper. Definitely not leather or heavy duty plastic, this stuff (maybe thin polyvinyl) looked unlikely to stand up under a trip down an exit ramp, forget a long journey from another country. I asked the person next to me who they were and got back one word: refugees. Not coming home but seeking refuge from war in Eastern Europe. The women gave it away. They wore calf length dresses in flowered patterns. Had I not known better, I would have thought they’d all alighted from Conestoga wagons after a weary trek across the prairie. In a way, I’d guessed right. The women wore scarves, mostly black, cinched around their heads, tied under their chins, down to their shoulders so not even bangs or a single bedraggled tress dangled out of the edges. Muslim women. Muslim men. Muslim children. Muslim people, dozens of them, plodding down the ramp. All of them silent, sad, tired, dejected. As I heard that word, refugee, I realized I could be looking into the faces of my own grandparents and great-grandparents who also fled persecution from the czar and hate mongers, from fear, repression, prejudice, and war in Europe. They came to the United States at the turn of the last century. The Muslim men resembled the men of my family, thin and haggard. The Muslim women looked like my bubbie, blank expressions except for those who wore worry like a permanent tattoo. And the Muslim children – the children looked like no children I’d ever seen. Wary of strangers, somber beyond their years. People who had escaped but feared for those who had not, friends and family left behind because sometimes that’s what must be done. 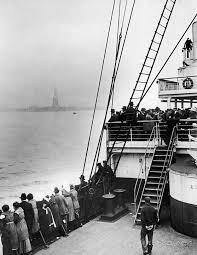 My family lumbered down the gangplanks of ships in New York Harbor. These people lumbered from airplanes. They were not just refugees – the Muslims, the Jews – they were escapees, they were survivors, their futures uncertain but more promising than the bleakness of the countries they fled. No one moves to another country, leaving behind parents, friends, and neighbors to live in an apartment in a strange city. No one risks the lives of their children and accepts the peril of traveling through hostile lands, strange communities, to live in a place where the language and culture are foreign – unless significant threat forces them. My son did walk down that airport ramp finally. I always knew I’d see him again. I knew he’d come home. Saturday, at airports in New York and Los Angeles, thousands of people worried that they would never again see their loved ones. Alien status. Unwanted despite passports, documents, VISAs. Denied because of an executive order, illegal, undemocratic, unconstitutional, prejudicial, and despicable. Remember a simple fact. We are all immigrants. Whoever you are, you came from someplace else, your ancestors came from someplace else. We left behind many who loved us and many who missed us and most we never saw again. These provoke human movement: fear, discrimination, hunger, persecution, hatred, war. Your family got a chance. So did mine. I did not forget. Look in the mirror. Who do you see? When I look, I see an immigrant’s child.